At Kitsons we understand that life isn’t always easy. People with limiting conditions such as advanced cancer, Chronic Obstructive Pulmonary Disease (COPD), heart failure and Motor Neurone Disease, are increasingly being advised by the NHS, Macmillan and hospices, to think ahead and make decisions about how and where, they would like to be cared for, when they are no longer able to communicate for themselves. We see that the need for advance care planning is becoming ever more pressing and that people want us to make the connection, between what they are being told by their health care professionals and the impact of their failing health, upon their lives at home and work. We strongly recommend that you plan ahead and put your LPAs in place now, rather than waiting until you need them, so your attorneys can act on your behalf immediately, if that is what you would like. If you do not have LPAs in place, it can be very stressful, time consuming and expensive for your loved ones or friends to seek permission from the Court of Protection, to obtain permission to help you. For further information please contact Marjorie Creek on 01752 603040 or by email marjorie.creek@kitsons-solicitors.co.uk. Marjorie is a qualified solicitor, a fully accredited member of Solicitors for the Elderly and unusually, until recently, also a Registered Nurse (Adult). 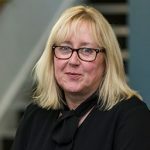 With a BSc in Health Studies and specialist qualifications in care of the dying and palliative care, she has particular expertise in assessing mental capacity and is happy to help people with communication difficulties or complex care needs, in all types of healthcare settings. She primarily focuses on elderly client care, financial abuse and safeguarding issues in the elderly, alongside more general private client work in wills, probate and lasting powers of attorney. Marjorie is a Dementia Friend Administrator within the firm and blogger for the Law Society.